Dewey Whetsell a longtime commercial fisherman, veteran fire fighter and fire chief, jazz musician, and poet from Alaska penned a very nice retort to all of those who would say Sarah Palin isn't the real deal, a true leader. You can check out Dewey Whetsell's website here, the man has a very interesting life's story. "The last 45 of my 66 years I've spent in a commercial fishing town in Alaska. I understand Alaska politics but never understood national politics well until this last year. Here's the breaking point: Neither side of the Palin controversy gets It's not about persona, style, rhetoric, its about doing things. Even Palin supporters never mention the things that I'm about to mention here. 1- Democrats forget when Palin was the Darling of the Democrats, because as soon as Palin took the Governors office away from a fellow Republican and tough SOB, Frank Murkowski, she tore into the Republicans Corrupt Bastards Club (CBC) and sent them packing. Many of them are now residing in State housing and wearing orange jump suits. The Democrats reacted by skipping around the yard, throwing confetti and singing la la la la (well, you know how they are). Name another governor in this country that has ever done anything similar. But while you're thinking, I'll continue. 2- Now with the CBC gone, there were fewer Alaskan politicians to protect the huge, giant oil companies here. So, she constructed and enacted a new system of splitting the oil profits called ACES. Exxon (the biggest corporation in the world) protested and Sarah told them don't let the door hit you in the stern on your way out. They stayed, and Alaska residents went from being merely wealthy to being filthy rich. Of course the other huge international oil companies meekly fell in line. Again, give me the name of any other governor in the country that has done anything similar. 3- The other thing she did when she walked into the governors office is she got the list of State requests for federal funding for projects, known as pork. She went through the list, took 85% of them and placed them in the when-hell-freezes-over stack. She let locals know that if we need something built, well pay for it ourselves. Maybe she figured she could use the money she got from selling the previous governors jet because it was extravagant. Maybe she could use the money she saved by dismissing the governor's cook (remarking that she could cook for her own family), giving back the State vehicle issued to her, maintaining that she already had a car, and dismissing her State provided security force (never mentioning, I imagine, that she's packing heat herself). I'm still waiting to hear the names of those other governors. 4- Now, even with her much-ridiculed gosh and golly mannerism, she also managed to put together a totally new approach to getting a natural gas pipeline built which will be the biggest private construction project in the history of North America. No one else could do it although they tried. If that doesn't impress you, then you're trying too hard to be unimpressed while watching her do things like this while baking up a batch of brownies with her other hand. 5- For 30 years, Exxon held a lease to do exploratory drilling at a place called Point Thompson. They made excuses the entire time why they couldn't start drilling. In truth they were holding it like an investment. No governor for 30 years could make them get started. This summer, she told them she was revoking their lease and kicking them out. They protested and threatened court action. She shrugged and reminded them that she knew the way to the court house. Alaska won again. 6- President Obama wants the nation to be on 25% renewable resources for electricity by 2025. Sarah went to the legislature and submitted her plan for Alaska to be at 50% renewables by 2025. We are already at 25%. I can give you more specifics about things done, as opposed to style and persona . Everybody wants to be cool, sound cool, look cool. But that’s just a cover-up. I'm still waiting to hear from liberals the names of other governors who can match what mine has done in two and a half years. I wont be holding my breath. By the way, she was content to to return to AK after the national election and go to work, but the haters wouldn't let her. Now these adolescent screechers are obviously not scuba divers. And no one ever told them what happens when you continually jab and pester a barracuda. Without warning, it will spin around and tear your face off. Shoulda known better. As we have been saying for a long time, Sarah Palin was an incredibly effective Governor, and a true servant of the people. The kind of woman who isn't afraid of whatever challenge that faces her. As she has shown in the past few weeks, she is more than ready to take on big government, like she has big oil. 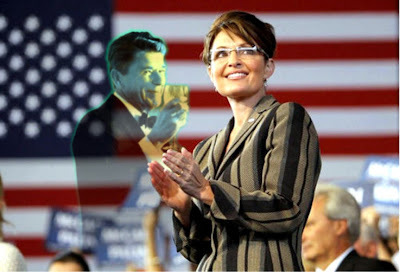 And if Sarah Palin could tame Exxon-Mobil, I'm sure she will make quick work of D.C.!